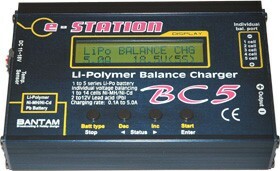 BC-5 has the individual voltage balancer that is exactly identical with PB-5 for Li-poly battery inside. BC-5 can charge Ni-Cd, Ni-MH and Pb batteries too but it does not have discharge function. When the 'Balance charge' mode being performed, the balancing adapter should be connected to the balancing tab of battery pack, as well as the charger's charging lead should be connected to the output of battery pack. And also, please pay attention to the polarity of the battery pack's output which goes to the charger's output. If it is reversed, the short-circuit can be happened on the battery pack. BC-5 comes with a set of individual cell connectors to link with various type of Li-poly battery pack.